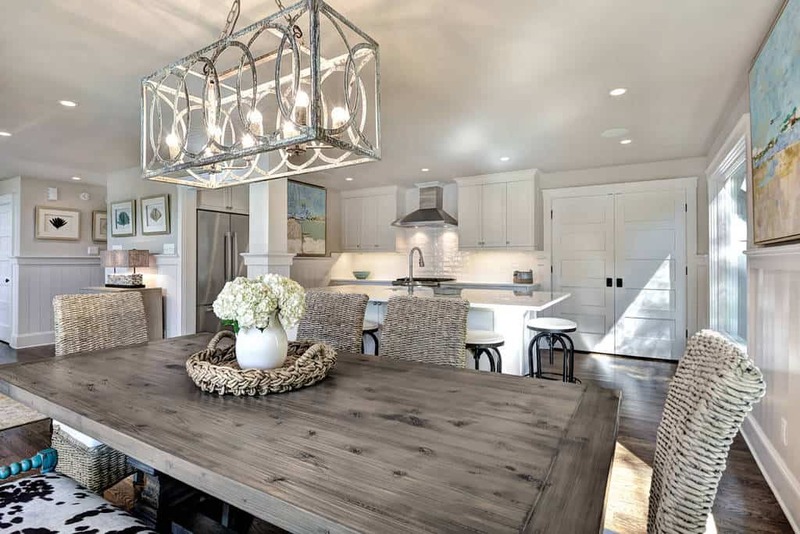 There are so many different things that you can do with your dining room. You can choose from a myriad of design styles and approaches, and mix elements that best suit your taste and personality. 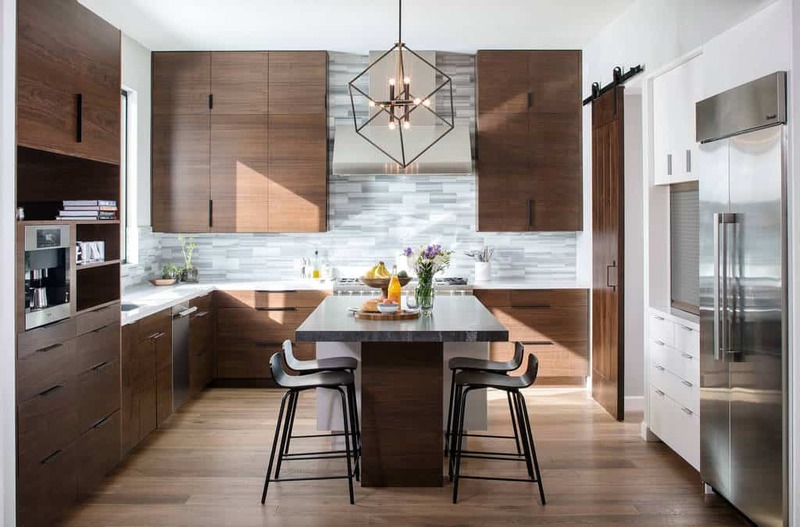 Perhaps you want to completely re-do your dining room, or maybe you just hope to add a few new elements to refresh your space. Either way, you are sure to find inspiration here. If you appreciate the unique, perhaps you’d like a blue velvet banquette, a plethora of book shelves, unusual mirror frames, or an arboreal-inspired chandelier. Or if you prefer the luxurious, rose-tinted taupe, champagne curtains, stone fireplaces, and elaborate chandeliers might be more up your street. Enjoy! 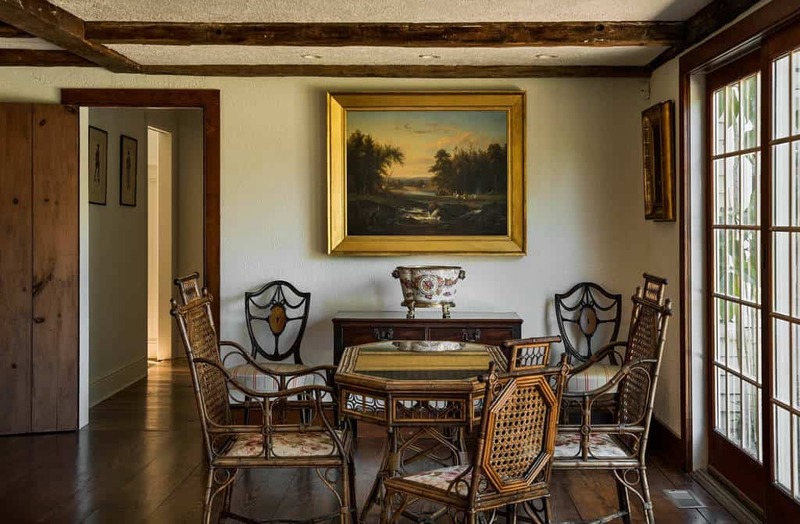 This dining room’s captain’s chairs are distinguished from the others by a slightly winged design. The pale jade color on the walls also contributes to the room’s refined atmosphere. 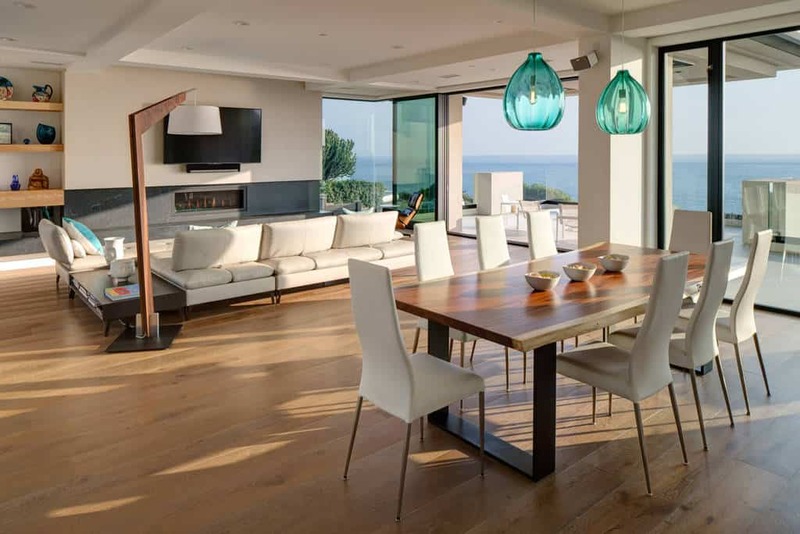 This contemporary open-concept design creates a sense of space and freedom. These pale pine hardwood floors look beautiful with the light allowed in by generous windows. Cushioned window seating and a glass table serve as a splendid breakfast nook in this lovely room. 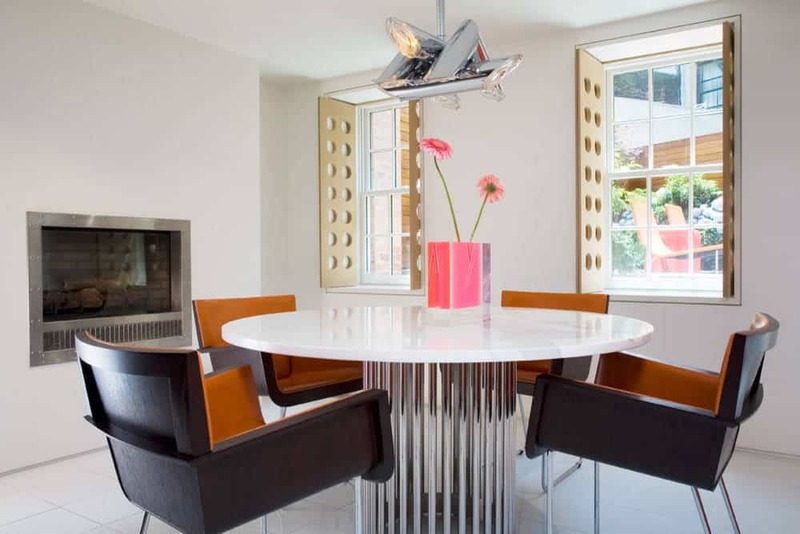 These chairs adorned with a geometric design will add an extra modern touch to any dining room. 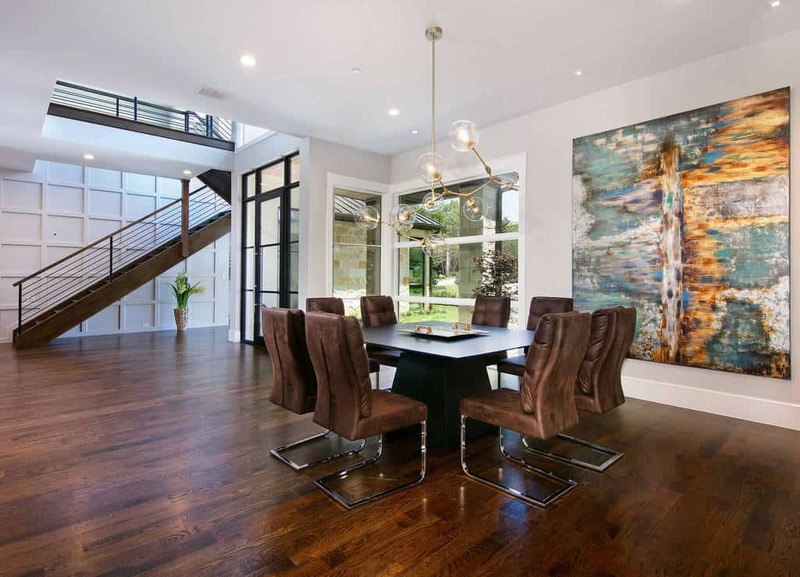 This dining room’s unique steel chandelier and loft-like atmosphere create an industrial feel. Velour chairs in a bright shade of blue create an interesting counterpoint. These charming rattan and wood chairs have a decidedly period look, as does the rose and white pottery on the sideboard. 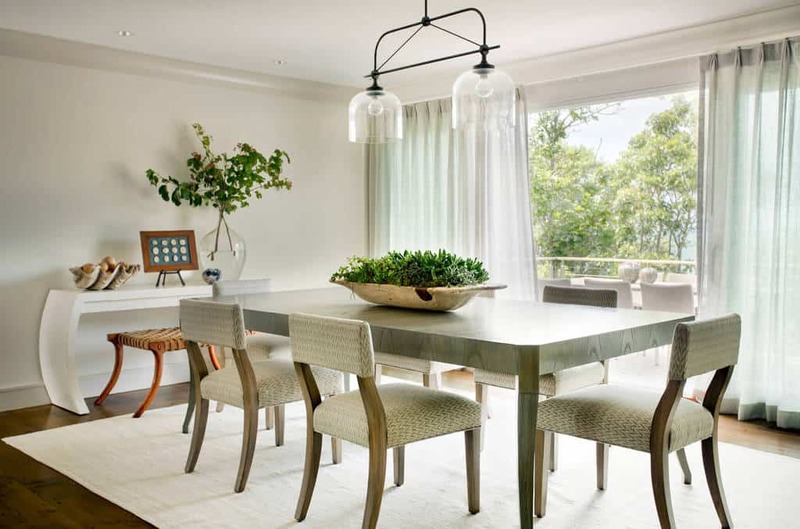 These champagne-colored curtains with a subtle print add elegance to the dining room. 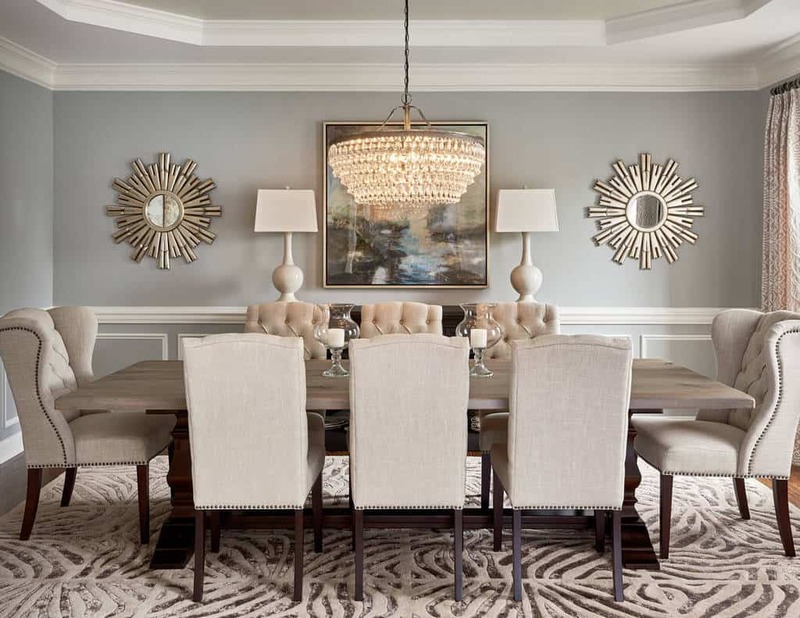 This impressive dining room makes excellent use of shades of rose-tinted taupe on its walls and furniture. 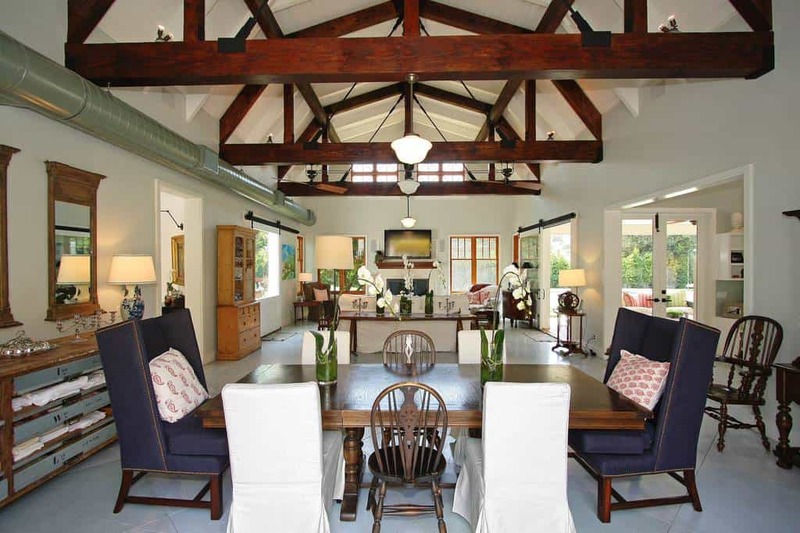 Ivory arches over display cabinets and windows sets off the beauty of the room’s other design features. 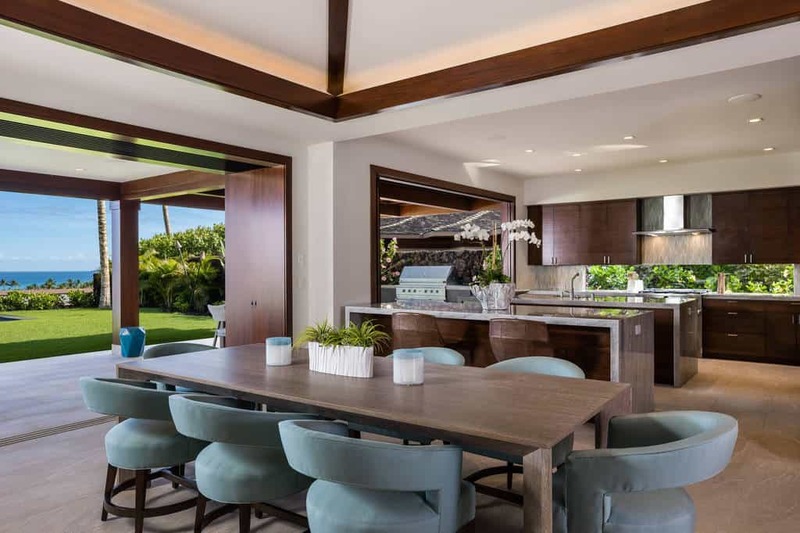 This open-concept space features a generous dining room table positioned down the middle of the room, creating a sense of symmetry. This room’s round mirror has an intriguing spiked frame that adds an industrial element. Photo by GM Construction, Inc. 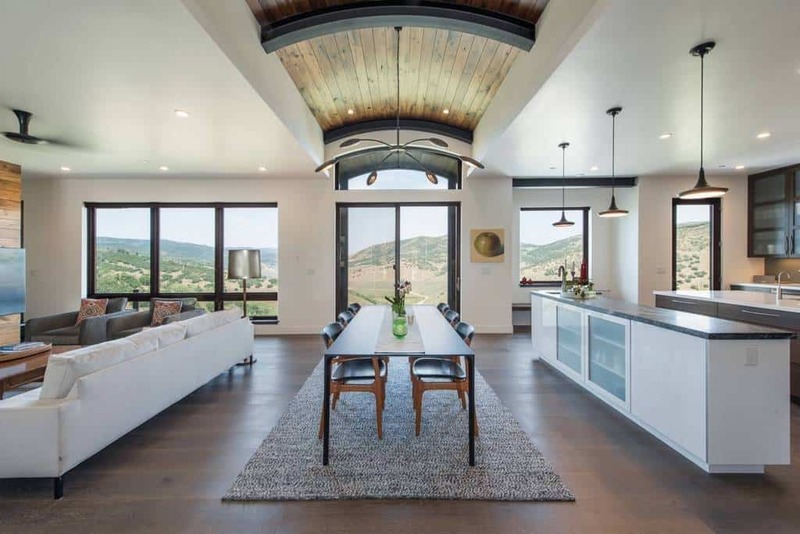 This stylish dining room’s view and ready access to the outdoors means that you can enjoy the beauty of green scenery while partaking in indoor comforts. These beige patterned chairs with curved legs are both stylish and comfortable. 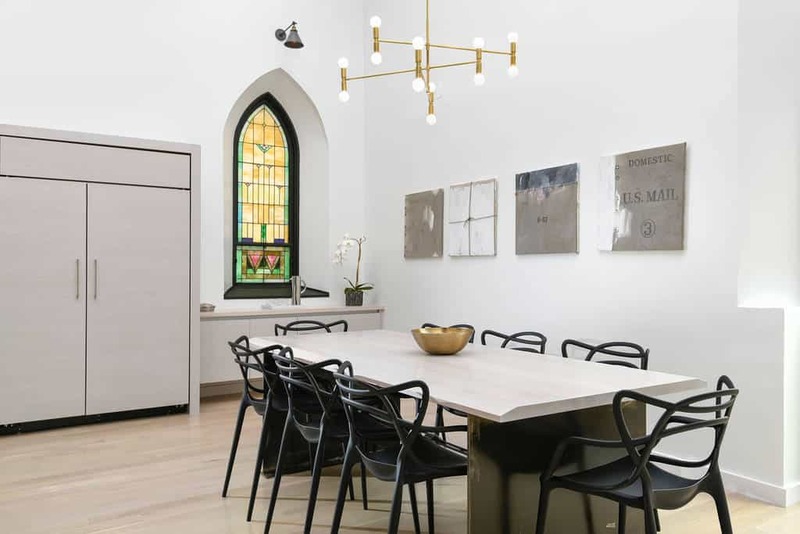 Photo by K.Marshall Design Inc.
A light-filled room always cheers the mind. Who says that the dining room is just for eating? This space offers numerous shelves for your book collection. 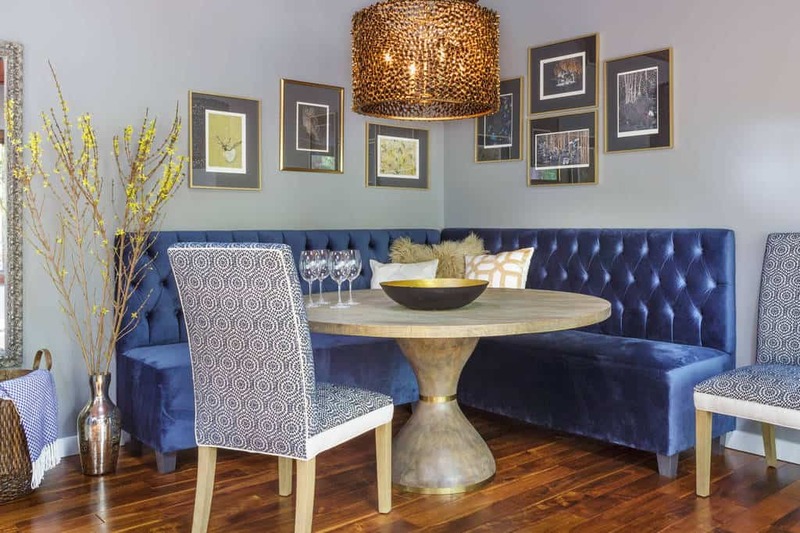 This blue velvet banquette beautifully complements the periwinkle walls and chairs. Create a fresh and breezy atmosphere with turquoise blue textured walls and airy white curtains. 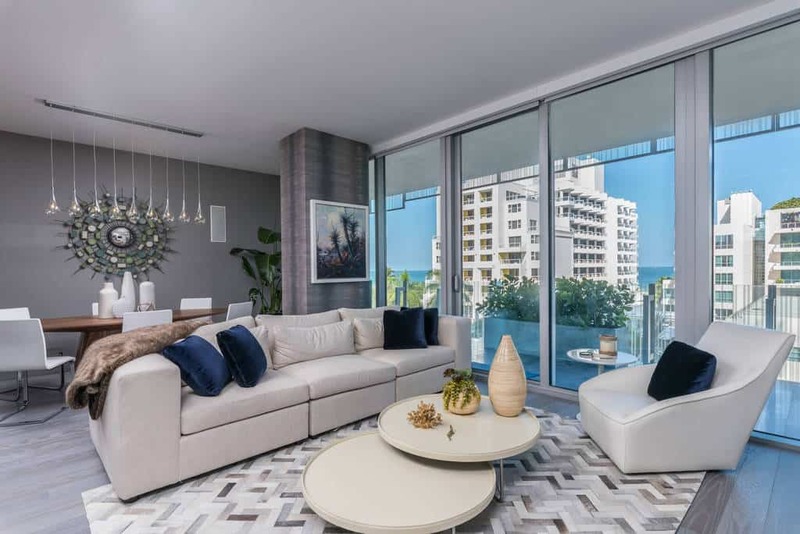 This combined dining and living room has a distinctly uptown feel, mainly because of its sophisticated furniture and design accents. 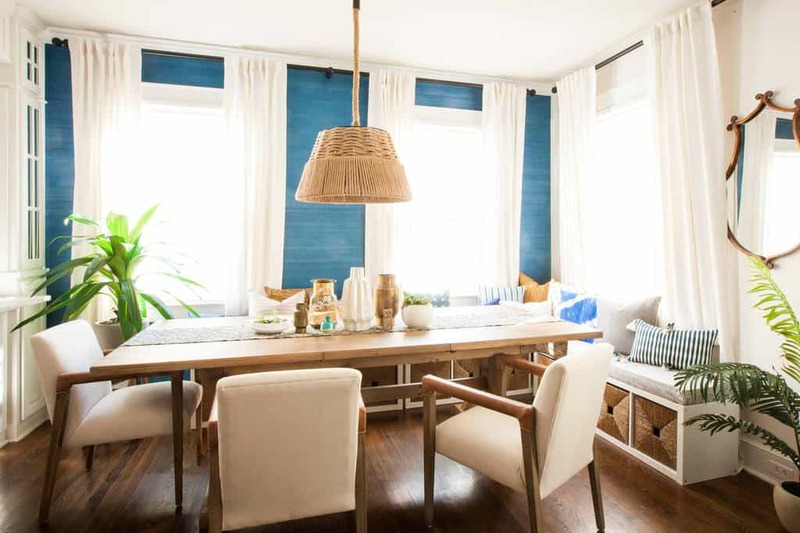 This lovely white and blue banquette works well with the white-trimmed windows of this space. This dining room’s taupe textured wallpaper and peach chairs are a lovely combination. 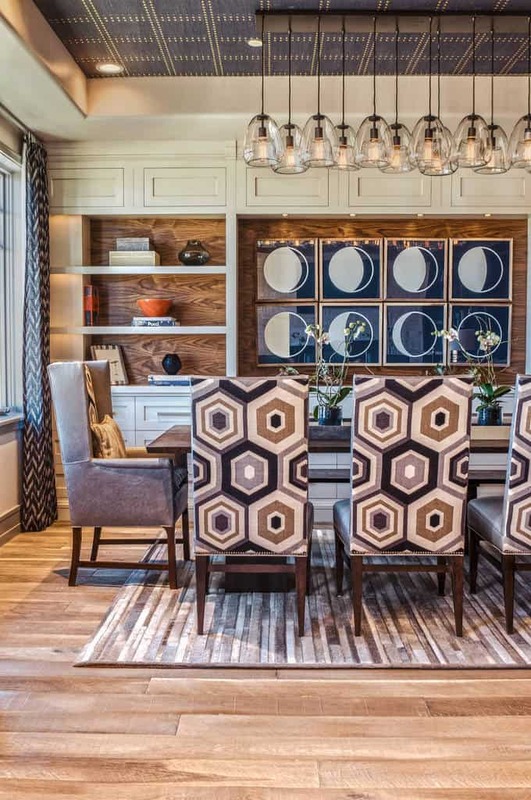 Don’t be afraid to be eclectic in your choice of seating for the dining room. Let your excellent taste be your guide. 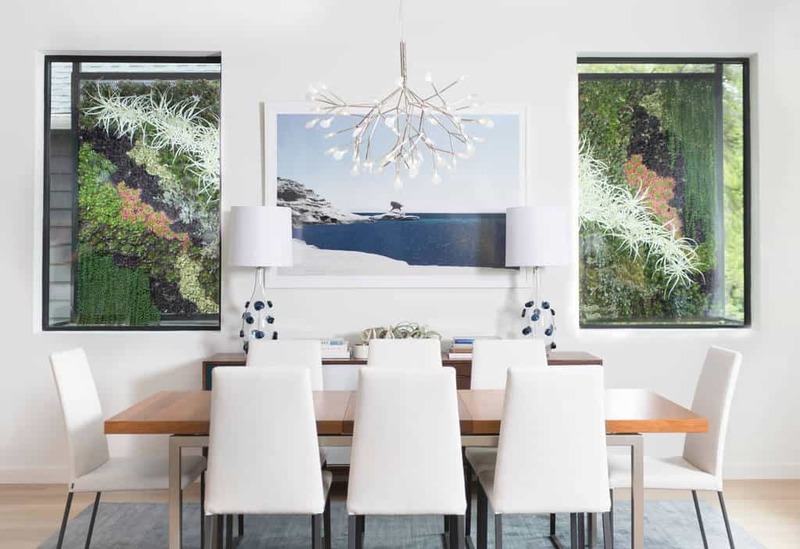 This dining room’s chandelier in the shape of a tree branch or group of twigs is a fun choice. A stained glass window will add a splash of color and interest to any dining room. 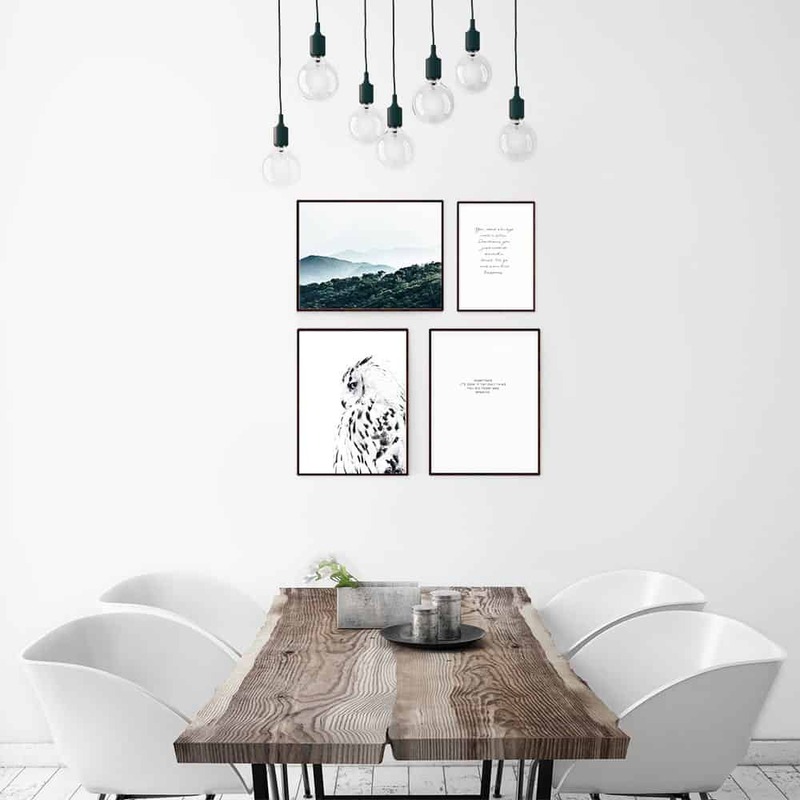 This room’s highly rustic table and plain white walls work well with more sophisticated elements, such as the art prints adorning the wall. 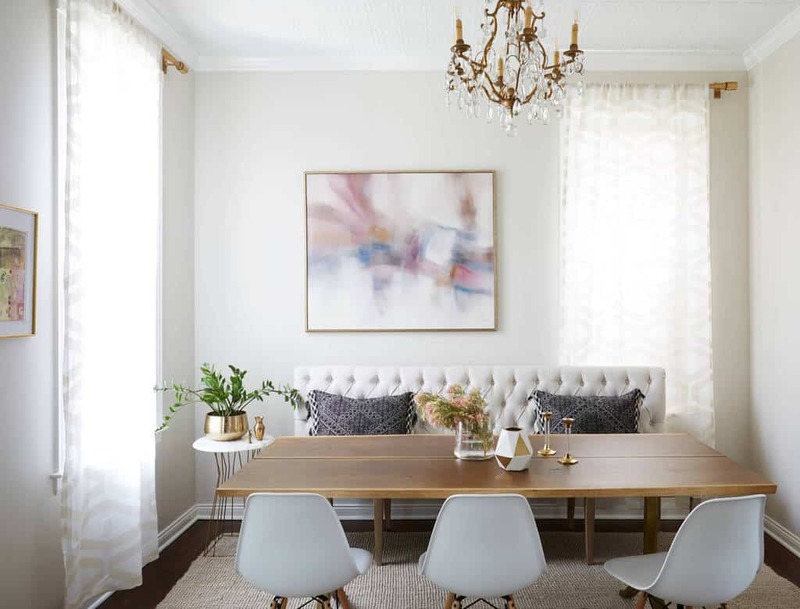 This dining room is a dream come true for any pink enthusiast. 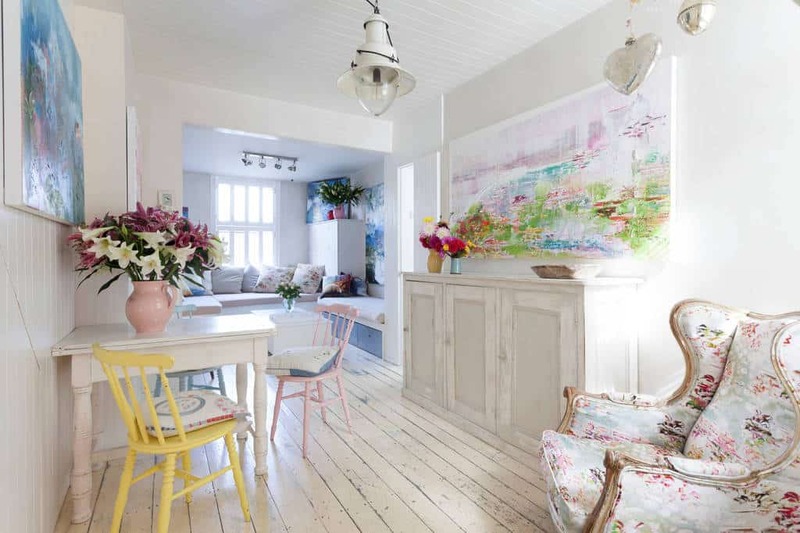 Soft rose permeates this room, and a splash of yellow adds extra interest. This beautiful round dark-wood table looks especially stylish centered on a plush rug. 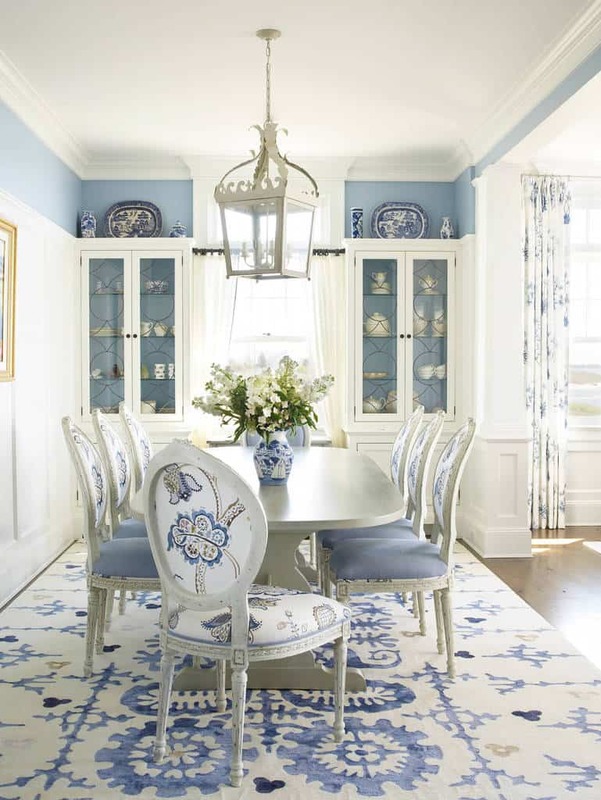 This blue and white dining room echoes the look of classic porcelain. Elaborate chandelier and recessed lights add to the daylight already pouring through this fashionable dining room’s windows. Decorative wreaths aren’t just for the holidays! 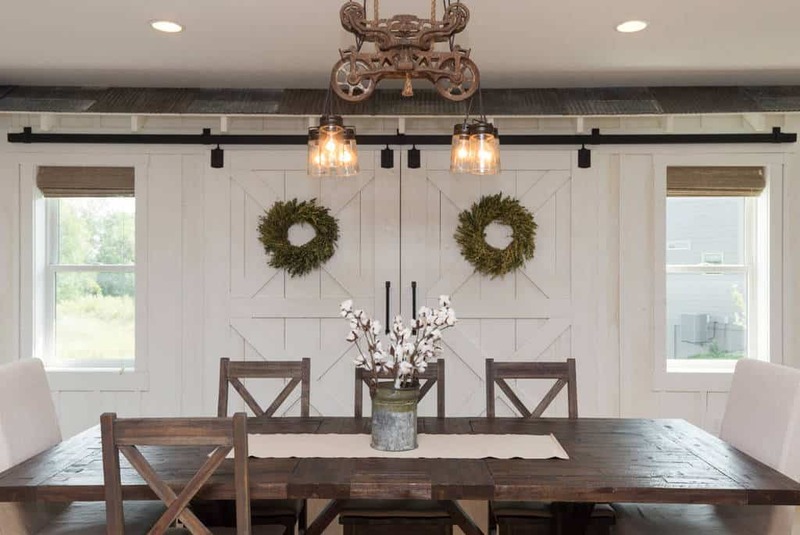 You can use them as a design accent in a rustic dining room. 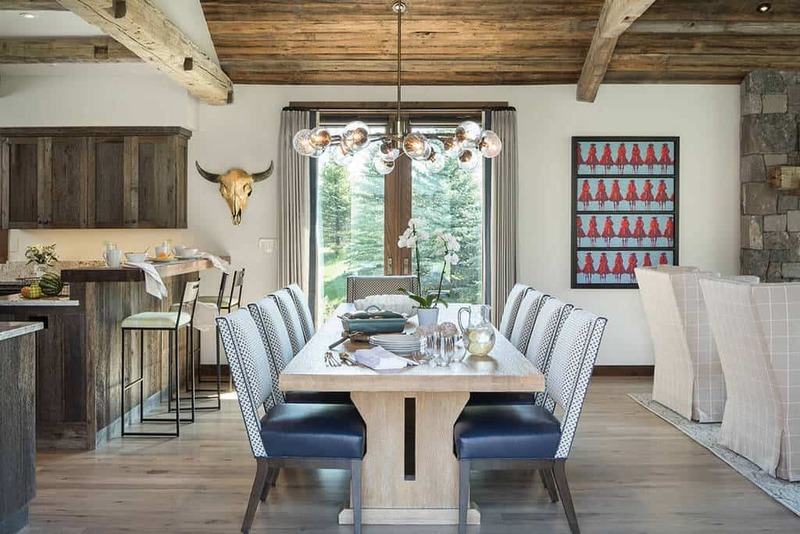 This dining room’s wooden plank ceiling and cabinetry add a rustic look to this otherwise sleek and modern atmosphere. 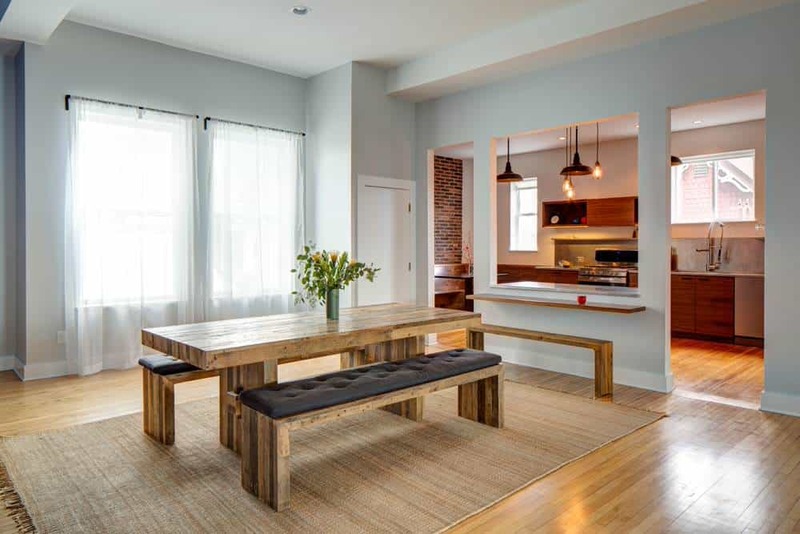 This simple dining bench is reminiscent of a picnic bench. It is cushioned, however, for much greater comfort and style. The pastel painting on this dining room wall beautifully complements the plush ivory banquette beneath. 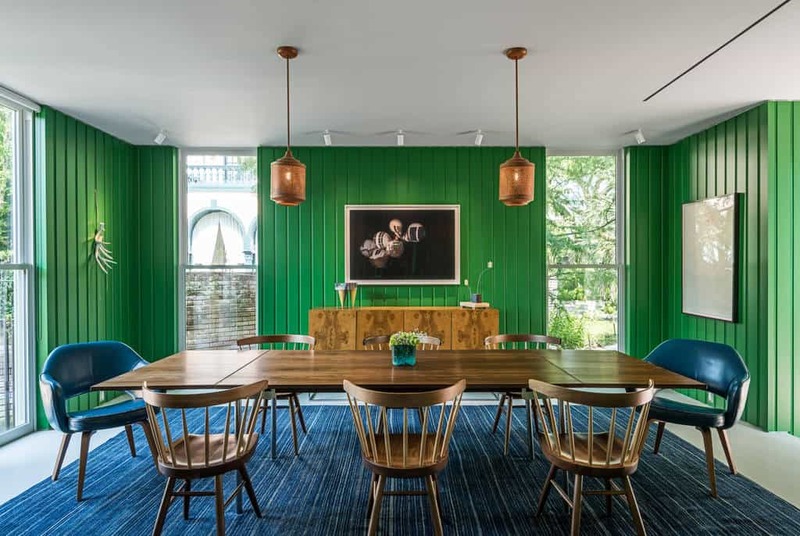 This dining room’s bright green wall panels are a unique yet undeniably stylish choice. This elegant stone fireplace is an impressive design element. 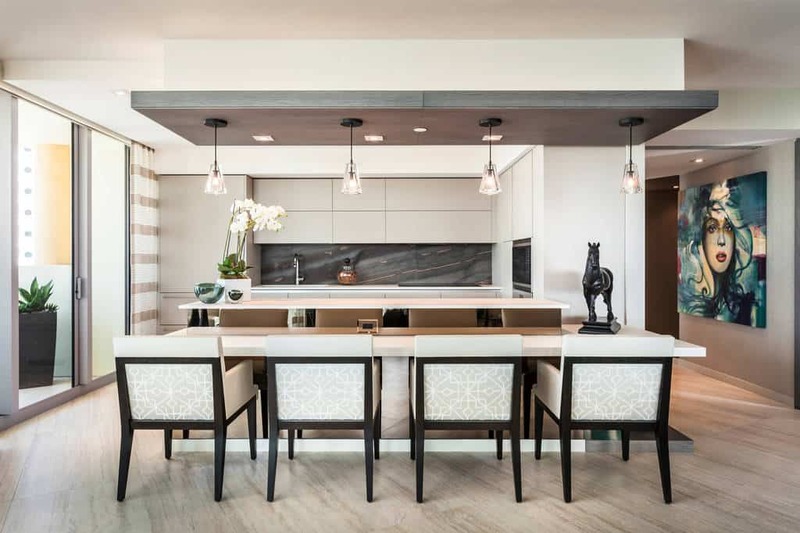 This combined kitchen and dining room has beautifully coordinated cabinetry and floors. Black floors with matching glass door frames are a stylish design choice. 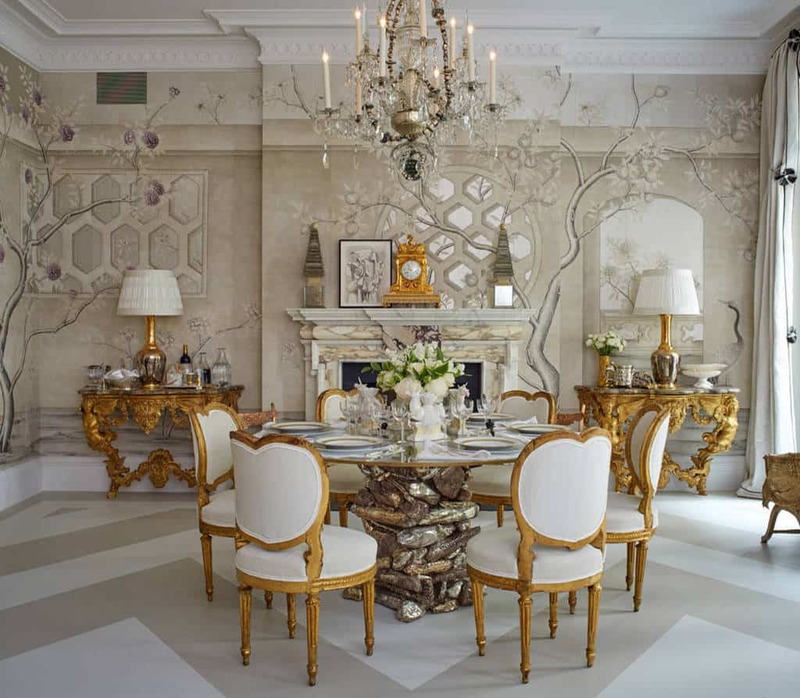 This dining room’s gilded accents and furniture are a design touch of unquestionable luxury. Photo by Audino Construction, Inc. 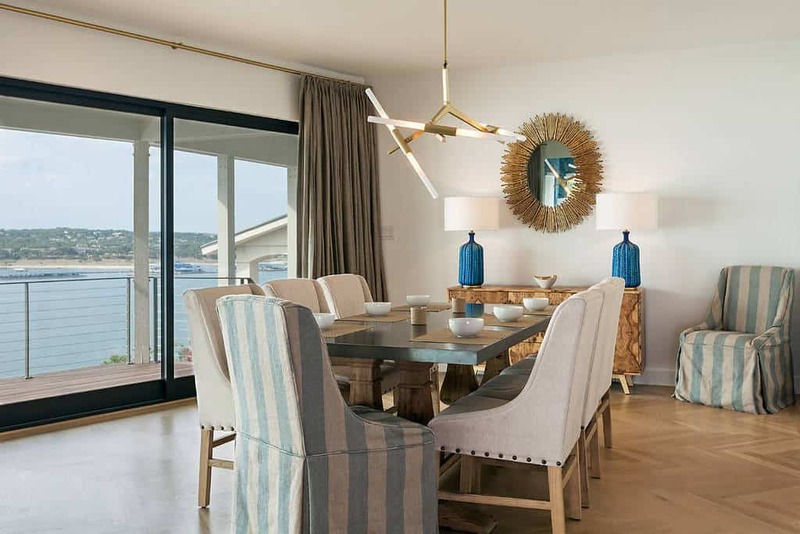 This chic yet casual dining room features coverings of sturdy linen on the captain’s chairs. Photo by Harper Construction Inc. 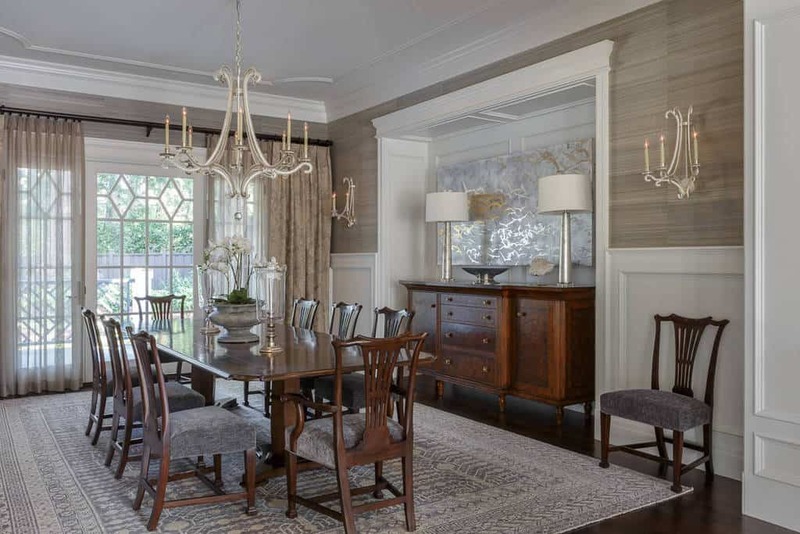 This dining room’s faded wood and gleaming chrome chandelier create a pleasing contrast. Simple textured champagne-colored wallpaper is featured in this room, as is wallpaper of blue and gleaming gold over the antique sideboard. This dining room’s ivory sideboard is both decorative and utilitarian, providing an abundance of storage space. This room’s latticed windows add an element of fancy to this highly modern space.